Come join us for an eco printing workshop with local fiber artist, Jonatha Foli. 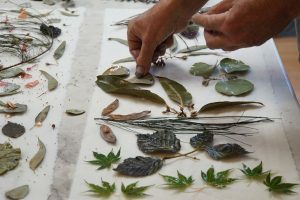 Using locally foraged plant material rich with tannins and wool fabric milled in New England, you will learn the history and techniques used to create an eco printed piece, and then create your own piece to take home. There will be a 30+ minute lunch break while the steaming portion of the process is taking place.